Hi friends! Karla back today to share a sweet fall hedgehog card using the adorable Cold Hedgehog digital stamp from the GSD shop. 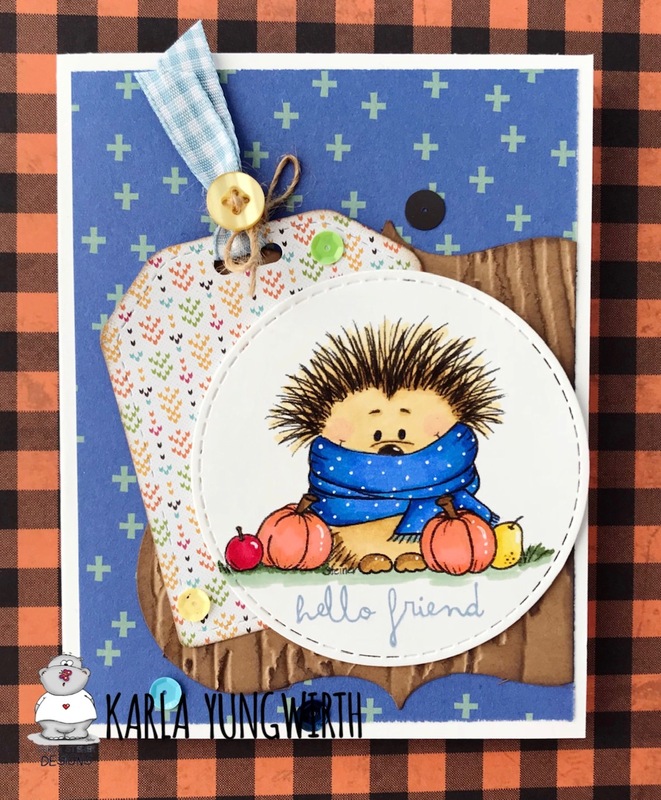 This cute little guy looks so sweet bundled up in his nice cozy scarf, and would make a perfect addition to a fall, thanksgiving or friend card. After colouring him in with Prismacolor and Hobby Colour Markers, which are both alcohol based, I used a white gel pen to add polkadots to his scarf and details to the rest of the image. I found some pretty papers and then used the Tim Holtz 3D Lumber embossing folder to create a fun wood effect on brown cardstock. Using various circle, tag, and shape dies I layered on all the elements and added a stamped 'hello friend' sentiment from a set in my stash. So cute stamp, and love the design!